1797 — Clippers bound from Guyana arrive in the port of London. Onboard, casks of rum branded “Old Sam” are set to cause an immediate stir. In the golden age of seafaring, rum was the currency of trade, and none was worth more than a drop of Old Sam’s. Sam was a man who demanded much of himself, his workers and his rums, but brimmed with generosity for guests and friends. By marrying traditional aged rums with his discriminating taste for quality ingredients, Sam established a reputation that, in the space of his own lifetime, travelled the seven seas over. Merchants, naval officers and New World adventurers alike found their way to his post on the Demerara River to share a story, a laugh and a taste of the latest blend. 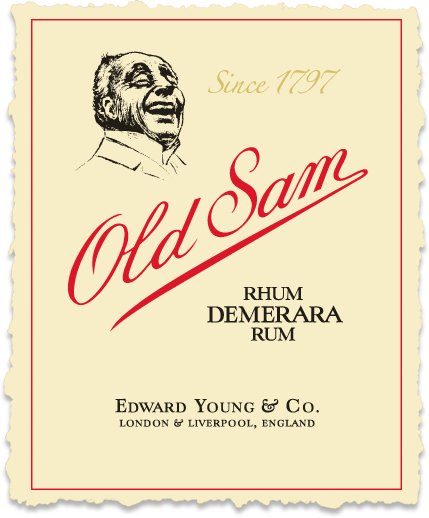 Some credit Old Sam with changing rum from a sailor’s grog to a dark, smooth spirit of distinction. A drink that, when mixed, comes to life with a signature froth like no other in the world. A tropical paradise, known for waterfalls, jaguars and beaches. It’s also the home of Demerara county. And Demerara is known for rum. With a tradition of quality over 300 years old, Demerara Rum is rich, dark and flavorful, suitable for mixing or enjoying straight. The Demerara process begins with fermentation. The basic ingredient of Demerara is dark Caribbean molasses. The first step is to mix the molasses with yeast. Fermentation takes about one day. Next, the fermented mixture is run through the still. The Wooden Continuous Coffey Still is the last of its kind still in use anywhere in the world. Steam is injected, allowing the alcohol vapors to rise to the top and condense into rum. The next step is the ageing process. Ageing takes place in 45 gallon oak barrels, stored in the warehouse. The warehouse holds 50,000 barrels, and contains rums as old as 25 years. Master blenders, intimately familiar with the tastes, aromas and qualities of different batches, painstakingly mix the rum in small batches, achieving a range of qualities and ensuring each blend has its own distinctive flavour.